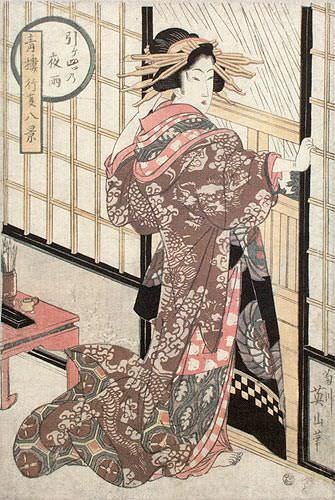 Silk/Brocade: 37.4cm x 103.5cm ≈ 14¾" x 40¾"
This Japanese woodblock print reproduction features a Geisha closing the door of her quarters as the rain begins. In the circle at the top, you will see the title, 引々四ツ乃夜雨 (Hikeyotsu no yau) which means, "Midnight Rain" or some will translate it as, "Rain at the stroke of Ten O'clock" or "Night Rain of the Viewing Hours." I read it as, "Overnight Rain." In the vertical box, to the left of the circle, it reads, 青楼行事八景 (Seirō gyōji hakkei) which is the series this woodblock print came from. 青楼行事八景 is usually translated as something like, "Eight Views of Daily Events in the Yoshiwara." At the lower right, you will see the artist's signature, 菊川 英山, followed by the character 筆 which indicates it was drawn by him (筆 literally means pen). The censor's seal, which is a tiny round stamp at the very bottom right, reads 極 (Kiwame) in seal script. The original woodblock was carved/created in Japan, between 1818 and 1820. Although other experts have suggested that this was created between 1814 and 1817.